The Poshtel has been designed in a Scandinavian minimalistic design theme. Here you can interact with a vibrant community of travellers. 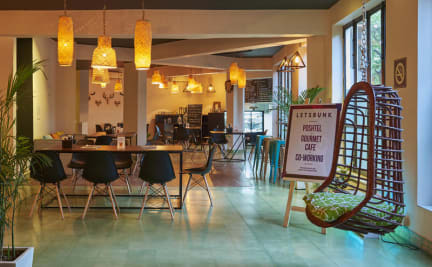 “Poshtel” is a fusion of a boutique hotel and a funky hostel where you can enjoy a luxurious stay and engage in the cultural milieu. Whether you are an explorer or a businessman who likes to bend the rules or someone who prefers seclusion and privacy or if you are a nomadic traveller yearning for new stories and faces - we offer a place of stay for everyone. You can choose between our private rooms, private quad room or our shared rooms called ‘Tribe of 6 & 8’. Our rooms are comfortable and stylish, our lobby buzzes with life and our rooftop will keep calling out to you. All our rooms have en-suite bathroom and courtesy amenities. We are located in the picturesque Hauz Khas Village, amidst greenery, a lake and historic walls and ruins (old like the 13th Century!). Hauz Khas Village is listed as one of the top ten places to check out in Delhi by Trip advisor. The neighborhood boasts of art galleries, cafes, fashion boutiques and fabulous restaurants/pubs in Delhi. The city of Delhi offers an intriguing mix of the old and the new, with historic domes, sprawling complexes and narrow intertwined lanes sure to charm you through your entire trip. Our property is just 20 minutes drive from the airport with all the major tourist attractions within a half an hour drive. * We organize Agra-Jaipur trips and can package a sweet deal for you! Best hostel i’ve stayed in! Nice place to chill. Good night life around if you are with friends.